In preparation for The Prairie School’s upcoming staging of Tim Robbins’ play Dead Man Walking, Prairie Upper School students and faculty joined local community leaders in a thoughtful panel discussion about the death penalty in the United States and around the world. The hour-long discussion served to provoke deep reflection on one of the key legal, sociological and moral issues of our day. Two additional seats on the panel were left open on a timed, rotational basis for students and teachers to participate in the discussion. 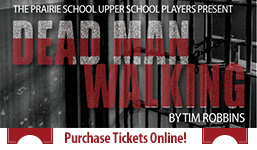 The Upper School-wide discussion and Prairie’s staging of the play itself reflects the school’s deep involvement with the national Dead Man Walking School Theatre Project. The aforementioned Project started in 2004 by Sister Helen Prejean, author of the book Dead Man Walking, and Tim Robbins, who crafted a powerful stage adaptation of the book. Instead of taking the play to Broadway, however, Robbins decided to use the play as a tool to stimulate deeper reflections on the death penalty in our nation’s high schools and colleges. He required that any school producing the play must also agree to involve at least two other academic departments to provide courses or discussions related to the death penalty and Dead Man Walking. Since the launch of the project, more than 235 high schools and colleges across the country have produced the play, conducted academic courses on the death penalty, and brought the issue to life on their campuses through art, music, and public education events. Prairie’s involvement with the Dead Man Walking School Project was initiated by Theatre Director Rebecca Greasby. Greasby has also expanded her cast’s viewpoints by taking them to meet Sister Helen Prejean when she spoke recently at Carroll University and arranging for her students to visit DePaul University to spend time in the Dead Man Walking Archives. The Prairie Upper School Players will perform Dead Man Walking on Thursday, November 13 through Saturday, November 15 at 7:30 p.m. Tickets are $6 for adults and $5 for students and senior citizens; purchase tickets online at www.prairieschool.com/shows/.